Downtown Fayetteville is an emerging area that is home to many restaurants, bars, and shops that are popping up everyday! It's now a place where you can enjoy great food, drinks, and shopping on any given day. Ashley Thompson started a design company in 2011 while her husband was deployed overseas. With her love for design, creative marketing experience and retail background she opened PRESSED- A Creative Space in 2015. Her goal was to create a place for people to be inspired through great design and unique products. 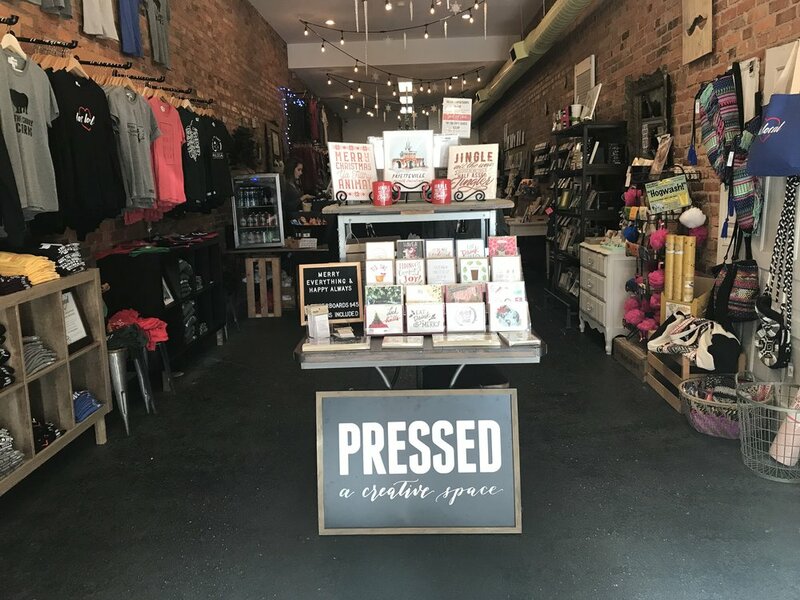 PRESSED is a place where people can find unique treasures, meet like-minded friends and discover what drives creativity! I always joke with Ashley and tell her she's responsible for making Fayetteville cool but I truly believe PRESSED is the coolest curated marketplaces in the area. Ashley is a leader in the community and has made it her mission to grow downtown Fayetteville not only as a business owner but as a member of the community! 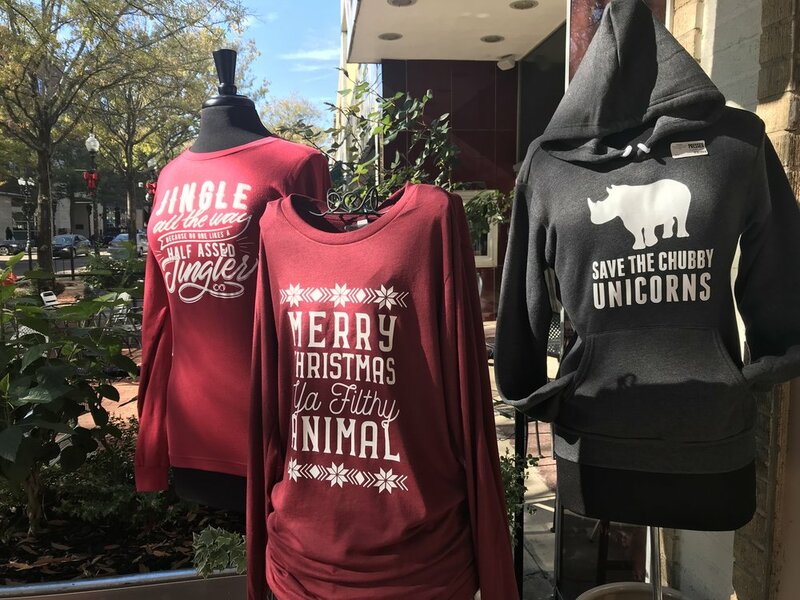 She strives to bring new and fun events to Downtown Fayetteville and shed a positive light on the once forbidden place. I wanted to share my interview with Ashley with you. Check out her advice on starting your own business and who and what inspired her to open PRESSED. I was really nervous in the beginning. It is a huge risk to leave a steady paycheck and start working for yourself! Now I don’t think I would be able to do it any other way, I can’t picture working for anyone besides myself. With all the long hours it can be hard to keep myself motivated, but then I think about how I am building something truly unique for my community and that keeps me going. When people bring their family from out of town to the store just to show them a unique piece of their city or I hear a story about how we inspired someone to start a creative endeavor it reminds me why I wanted to do this in the first place. You inspire so many entrepreneurs in this community, who inspires you? I love the story behind Johnny Cupcakes. I went to an Inc. Magazine conference back in 2013 through their military entrepreneur program and after hearing Johnny’s story I was so inspired by him. He uses his brand to create unforgettable experiences for his customers, and that is what inspires me to think bigger every day. Where do you draw inspiration from when choosing/creating new products for your shop? Everywhere! I keep my eyes open for inspiration all the time, you never know when it will hit! One of my favorite greeting card companies, Near Modern Disaster, I found while shopping at a local handmade market in Raleigh, NC. The idea for our popsicles came after I spent a week in Las Vegas and tried the best artisan popsicle. When I got home I did some research and found Locopops, a gourmet popsicle company right in Durham, NC. We kicked off a partnership shortly after that! I just keep my eyes open for something that is unique, tells a story or will deliver an awesome customer experience. You’ve made Fayetteville cool! What do you love about Fayetteville and why did you decide to put down roots here? I love Fayetteville. This city has people from everywhere around the world here, how awesome is that! It is also very transient, so there is always a new face and someone to welcome to the community. We specifically fell in love with the Downtown area because it has so much potential. You have this beautiful walkable area with historic buildings and lots of unique independently owned businesses. I really wanted to be a part of growing our downtown, so we decided to put some roots down and do everything we could to bring something great to our growing downtown. What do you see in the future for PRESSED? Our vision is to be a unique destination known for our one of a kind retail experience and insanely brand loyal customers from all over the world. So you will see us finding unique ways to deliver that one of a kind retail experience! We want to find new ways to engage with our customers and to keep developing our own unique products. Our line of Fayetteville items have been a huge hit. We really wanted to create a product line that showed off some Fayetteville pride because we thought our community needed more of that. Our product lines that give back to non-profits has also been a great way to engage with different parts of our community. We have a line of shirts that give back to Fayetteville Pride and our Love Local shirts give back to non-profits that support small business. You will definitely see more collaborations like this in the future! Use your resources. I wouldn’t have been able to do everything we have done if it wasn’t for all the people who helped me along the way. I have mentors that I still talk to when I need help with something. There are so many organizations out there designed to help you start a business, don’t be afraid to use them all. You don’t have a lot of time when you are starting a business, but I always made sure I took the time to keep learning. After a while I even started teaching some of the SBA classes, and even that was an amazing learning experience for me because I got to talk to small businesses owners and hear their problems. When you take time off or take a break what is your favorite thing to do? I love traveling because that gives me so much inspiration and reenergizes my creativity. Some of my favorite places to visit are New Orleans, Asheville and Nashville! It’s one of the only times I get to go see my family, so definitely just being able to see as much family as I can! My mom makes Chocolate Covered Peanut Butter Balls that are 100 times better than any kind of Reese’s. 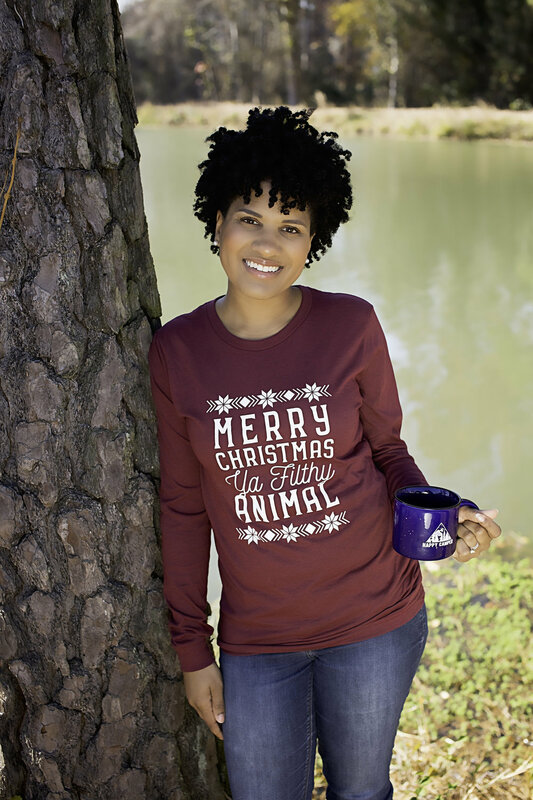 Click HERE to enter the giveaway for a chance to win a "Happy Camper," mug and "Merry Christmas Ya Filthy Animal" long sleeve tee!